While analysts and heads of banks signal cautious optimism about Europe’s economic recovery, Greece continues to appear on the brink. Even as Greek parliamentarians passed a bill late Monday ratifying tougher austerity measures enabling Greece to receive more emergency loans, tensions were high amid increased politically motivated violence. 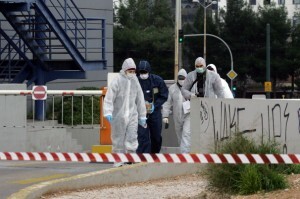 On Monday, an unknown attacker opened fire on the ruling New Democracy party headquarters in Athens. Police officials said no one was hurt. Earlier, a number of Greek journalists who have spoken in favour of the austerity measures were attacked with homemade bombs at their homes. No injuries were reported, however. Analysts say that the attacks may be the work of left-wing anarchists. On Monday, all of Greece’s political parties condemned the attack. But the leftist opposition has been highly critical of the government’s handling of the economy and bailout schemes. On Monday they voted against the government’s bill which included cuts in programmes for the newly unemployed and retirees above 65. Alexis Tsipras, leader of the major opposition Coalition of the Radical Left (SYRIZA), has said that European lenders need to revise their bailout agreements with Athens because the current approach was tearing Greek society apart. However, German Finance Minister Wolfgang Schaeuble told Tsipras on Monday that all options had been exhausted and there was no route but to follow the austerity regimen set by the Greek government. Last week Greece increased income tax on middle and high-income earners, self-employed and businesses, and also cut a slew of benefits. The Greek economy began to unravel in 2009 when the government announced it could not meet its huge debt due to massive overspending. Its budget deficit began to surge shortly after government financed the 2004 Athens Olympics. The debt crisis was further exacerbated when the global economic crisis hit and the government feared defaulting on its loans. It had no choice but to seek help from the EU and the IMF. Although the EU and IMF agreed to a total of over $300 billion in bailout loans, they demanded that the Greek government take severe measures to cut spending. Athens agreed but this measure was met with millions of Greeks taking to the streets in protest sometimes with violence reported between demonstrators and police. Greece’s economy has been in recession since the global economic crisis hit. However, if it is unable to show growth in the next two years, it is likely Athens will be unable to pay any debt to its foreign lenders, ultimately forcing it to leave the eurozone.